Since the 1980s, there has been an attempt by city officials to revitalize the downtown area. Historian Dan Holcomb noted "they don't say Augusta it's Auguster," in reference to his observation of the local dialect, noting that it had become pervasive and widespread throughout central to northern Maine by the mid to late 1980s. Surviving mill and factory buildings have been redeveloped into housing. 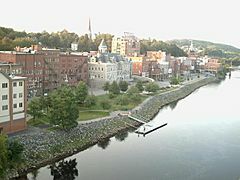 The dam on the Kennebec was removed in 1999 and the area around the dam has been turned into a city park. The city hall and other local government departments were relocated to the eastern bank of the river in the 1980s. 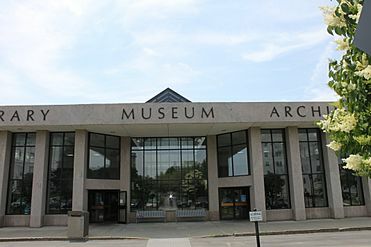 The Maine State Library, Museum, and Archives building is located across from the state capitol in Augusta. Augusta is located at , making it the easternmost state capital in the United States. According to the United States Census Bureau, the city has a total area of 58.03 square miles (150.30 km2), of which 55.13 square miles (142.79 km2) is land and 2.90 square miles (7.51 km2) is water. Augusta is drained by Bond's Brook, Woromontogus Stream and the Kennebec River. As of the census of 2010, there were 19,136 people, 8,802 households, and 4,490 families residing in the city. The population density was 347.1 inhabitants per square mile (134.0/km2). There were 9,756 housing units at an average density of 177.0 per square mile (68.3/km2). The racial makeup of the city was 94.1% White, 1.1% African American, 0.7% Native American, 1.5% Asian, 0.1% Pacific Islander, 0.4% from other races, and 2.3% from two or more races. Hispanic or Latino of any race were 1.8% of the population. 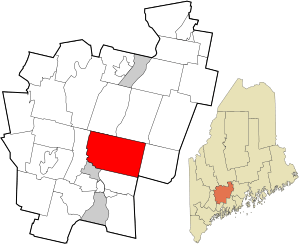 Augusta, Maine Facts for Kids. Kiddle Encyclopedia.